Dr. Rishi Ramlogan explains how Roux-en-Y surgery can potentially result in long-term diabetes remission as well as achieve dramatic weight loss. 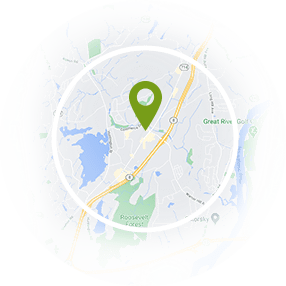 Derby, CT—According to the National Institutes of Health, obesity is a significant risk factor for the development and advancement of type 2 diabetes (T2D)—the most common form of diabetes. Dr. Rishi Ramlogan, a weight loss surgeon in New Haven area, says that patients typically seek out bariatric surgery to address excess weight and the health issues associated with a high body mass index (BMI). He indicates that studies have shown that gastric bypass surgery in particular can help individuals suffering from T2D reduce glucose levels in the bloodstream and regain glycemic control. Another benefit of Roux-en-Y surgery, he notes, is that this procedure can often achieve long-term results, even for people who have had diabetes for several years. Gastric bypass surgery, also called Roux-en-Y surgery, is designed to reduce the size of the stomach and redirect the digested content through a shorter length of small intestine, Dr. Ramlogan explains. As a result, he says patients who have undergone this procedure consume fewer calories and, due to the decrease in small intestine length, absorb less fat and nutrients as well, typically allowing the body to regain balance in glucose and insulin levels. 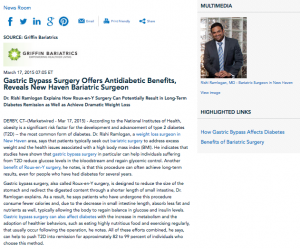 Gastric bypass surgery can also affect diabetes with the increase in metabolism and the adoption of healthier behaviors, such as eating highly nutritious food and exercising regularly, that usually occur following the operation, he notes. All of these efforts combined, he says, can help to push T2D into remission for approximately 82 to 99 percent of individuals who choose this method. Ultimately, Dr. Ramlogan says he strives to provide a helpful resource for obese patients diagnosed with T2D who are seeking healthier lives. By discussing the risks, benefits, and results typical of gastric bypass surgery, he says he hopes more people considering weight loss surgery will be able to make well-informed decisions about their care. While not appropriate for everyone, he suggests that Roux-en-Y surgery may be able to provide long-lasting weight loss and antidiabetic benefits for qualified individuals. A board-certified bariatric surgeon, Dr. Ramlogan earned his medical degree from the University of the West Indies before completing an internship and residency at the Mount Sinai School of Medicine in New York. He then completed additional training at New York Medical College (Sound Shore), where he later served as chief resident, and at Danbury Hospital in Connecticut, where he received fellowship training in advanced laparoscopy and bariatric surgery. He has a special interest in laparoscopic gastric bypass, gastric banding, and sleeve gastrectomy, and he believes every patient deserves compassionate care. Dr. Ramlogan is available for interview upon request.